Many thanks to all who contributed to the Fones4Life scheme the school is delighted to announce that we have reached the target of 250 mobile phones today on Happy Heart Day. 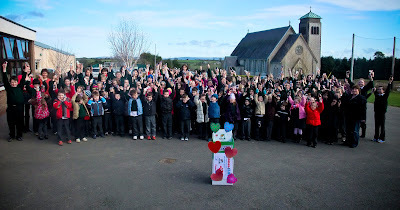 Many thanks to all the staff and pupils in Rathgormack N.S. who have succeeded in collecting unwanted mobile phones which we will exchange for a lifesaving defibrillator. We have collected the required 250 mobile phones and the "Fones4Life" scheme will provide us with a defibrillator and they will also give a donation of €100 will go to the Cormac Trust (www.thecormactrust.com). We would like to thank everyone for making such a special effort to collect the phones for this very important cause. Also many thanks to SuperValu in Carrick for sponsoring a crate of apples to celebrate the event. The Ceremony of Enrolment for Holy Communion for 2nd class will take place on Sunday 6th February at 9.45 am. As you will appreciate, it is difficult to schedule a day when, due to his busy timetable, Sean Kelly is available to lead our senior pupils on the short road-cycle, so as he is available on Wednesday 16th March we have decided to proceed with that day as our "Green Flag Day of Action". As previously planned the junior pupils and inexperienced cyclists will be led on a cycle within the school grounds. All participating pupils will be required to have a bicycle and helmet in school on the day. Barry Meehan, owner of World Wide Cycles, Clonmel will also be available on the day to show the children how to maintain their bikes. Due to the above changes the school will now be open on Wednesday 16th March. The school will also be closed on Friday 25th February due to the General Election. Don't forget to keep collecting those mobile phones – great work has been done to date but we still need a lot more. The deadline for collection of mobile phones is Monday 14th February, when will we celebrate heart day in the school.